Prewriting for dimensional film - Travelling within a film.Travelling within a film. 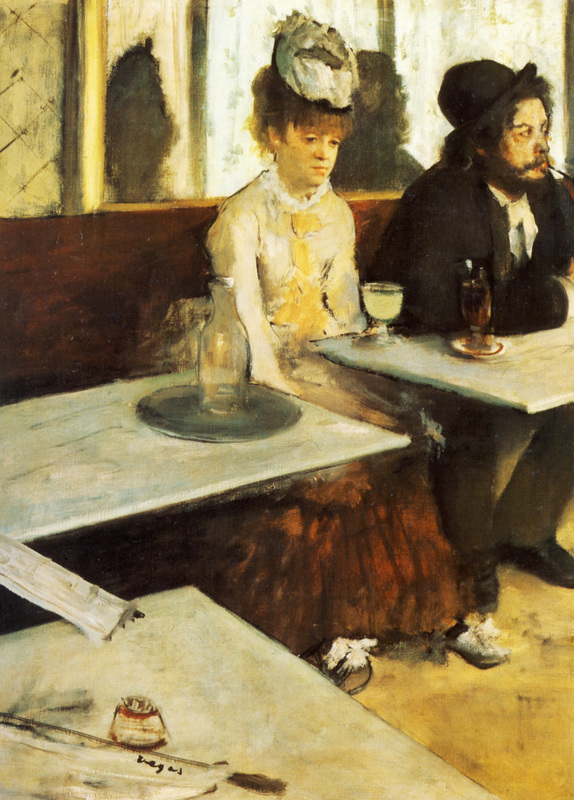 Paintings such as L’Absinthe by Degas inspired me on the notion of exploring the canvas as space. I firstly looked at the glass of Absinthe. Then at the absent look of the woman. Then I realised the tables she and the man are sitting on didn’t have legs., Suddenly the tables surfaces were floating. In the process of working on scripts and stories for dimensional storytelling I enjoyed developing ambients and constructing places and spaces through text. In a granite city far away live friendly people, passionate to sing and think and look for answers. A chain of mountains covers their horizon. They have as closest friends the city statues. The statues are of human size and form, except the one atop the central fountain which has the shape of big and silent fish. The white stone figures decorate the city but also populate it. They often come to life and walk the streets to meet with young and old, to share ideas, laugh and talk. The only wind that swirls the streets is dry and fast. Statues don’t like it and are always frozen while it lasts. That is also the reason this wind is left without a name. People believe it carries songs from city to city. The bond between people and statues is of a particular importance to both. The first consider the second as their guides in understanding and loving existence and as protectors from the unknown. The second do not see, hear or feel one another and cannot communicate if not with the help of the first who transmit their messages. This is how ancient stories are never forgotten in this place. One day a giant volcano in the mountain erupts and its lava splashes down through the streets and houses covering every corner of the stone city. People are caught by surprise and cannot escape. Fast dry wind bursts for two weeks. When statues wake up and search for their fellow man all they find is frozen figures and silent faces. Since then they wander the streets and on a windy day one can hear them sing. Imagine being a spectator in the middle of this square.